When your label integrity is critical, you need more than just a scanner or label validation system. You need a labeling system that can VERIFY bar codes against ISO standards as well as validate design integrity. AND, wouldn’t it be great if that system could be done BEFORE the label is applied? 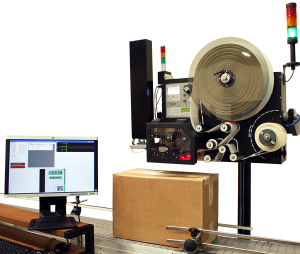 FOX IV Technologies is excited to introduce our NEW V5440 Print/Verify/Apply On-Demand Labeling System with in-line verification. The verification technology is integrated directly into the FOX IV print and apply system to seamlessly verify barcodes and validate label design while the label is printing, so that EVERY label is verified. Should a label be outside of the set parameters with either a barcode grade or the label being blemished, the system can send a warning or fault to alert operators or the WCS. The V5440 is unique in that it truly is in-line verification for on-demand print and apply labeling,” according to Rick Fox, President and CEO of FOX IV. “Many people confuse scanning with verification. Verification compares a bar code to published standards, such as GS1. Scanners or vision systems only can tell if a code is readable or if it matches a template, or ‘Golden Label,’ but not if it meets the standard. Meeting the standard ensures that anyone in the supply chain can read the code regardless of their scanning equipment. That’s critical in a multi-step supply chain. The V5440 does both verification and validation. Barcodes (1D and 2D), including UPC, GS1-128, Data Matrix and QR Codes, are verified to ISO standards to ensure that they are in compliance. Even multiple bar codes on the same label can be verified. Additionally, the label design can be compared to a Golden Label template to check for blemishes. If the verification or validation results fall outside of the acceptable set parameters, then the system can be stopped or a fault/warning signaled so that problems can be addressed. Because 100% of labels are verified in-line, not just a random sample, label problems are caught immediately without any product receiving a bad label. The in-line verification system on the V5440 works in conjunction with verification software. The software enables acceptable parameters to be set for warnings and faults. During the print run, it displays the verification results, a histogram of reads in that label run, and an image of the label that was just verified. There are also historical logs for each print run and printable summary reports. Middleware software that manages the formats, submits regulatory data, and creates an audit record is also available as an option. Built on FOX IV’s Standard print and apply platform, the V5440 is capable of extended print runs as a result of the large capacity label supply. With its proven industrial design, simple to follow label paths and HMI, plus an industrial print engine, the V5440 is capable of 24/7 operation. The FOX IV V5440 with in-line verification is ideal for UDI/Medical Device labeling, HDA serialized barcode labeling, and all GS1 compliance labeling. It is also useful for retail labeling as it ensures that every label printed and applied can be scanned since it complies to GS1 barcoding standards. WalMart in particular has been vocal about unreadable barcodes which lead to its revised barcoding requirements earlier this year (Walmart’s claims that GTIN barcodes printed by another method are often so illegible that they can’t be scanned by store associates – leading to compromised EDI exchange, manual inventory and stock replenishment, and wasted time.) Verified, not merely validated, barcodes would eliminate this issue. FOX IV’s New V5440 Print/Verify/Apply Labeling System will make it’s debut at Pack Expo 2016 Booth #N-5737.